“Settlements are not an obstacle to peace,” says Rev. Michael Faulkner, ex-NY Jets lineman, tells Arutz Sheva. He also quotes the Talmud. This may be the first time that the Rev. Michael Faulkner is running for elected office, but it is not the first time that Faulkner is running. If the name sounds at all familiar, especially to sports fans, it is because this passionate Christian evangelical minister is also a former NY Jets defensive lineman and has more than ample practice achieving his goals both on the gridiron and on the field of life. Israel National News spoke with Rev. Faulkner (R) about his campaign to unseat his political rival, Charles Rangel (D-NY); a political icon who has spent the last 40 years representing the people of Manhattan's 15th congressional district, which includes the upper West Side, Harlem and Washington Heights. Rangel, the former chairman of the House Ways and Means Committee, has been the subject of media scrutiny as of late because of 13 violations of congressional ethics standards that were leveled against him by House investigators. The allegations include failure to report rental income from vacation property in the Dominican Republic and hundreds of thousands of dollars in additional income and assets on his financial disclosure statements. Other charges focused on Rangel's use of congressional staff and stationery to raise money for a college center in New York named after him; accepting favors and benefits from the donors that may have influenced his congressional actions; use of a subsidized New York apartment as a campaign office instead of a residence; and misuse of the congressional free mail privilege. "I am throwing my hat in the ring and running for Congress because I personally feel, as do my consituents, that greed and corruption is choking the life out of our government" said Faulkner. We are living during one of those times in history when people are saying enough is enough. We need representatives in Congress who do not have a personal agenda, but rather we must elect those who seek to solve the problems that government has imposed on the people. I have always believed that the highest calling is to serve the powerless and to speak for the voiceless," he continued. Rev. 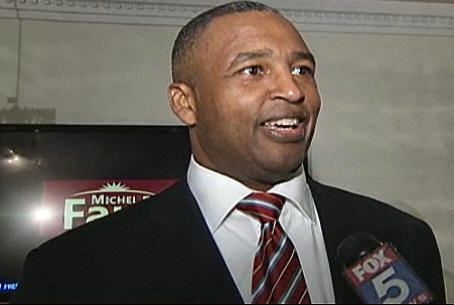 Faulkner's position as pastor of the New Horizon Church in Harlem has allowed him to tune in to and gain a hands-on understanding of the issues effecting his constituency. Having received his ordination in December of 1991, Faulkner has rooted himself in the community he serves by leading the ministries specifically geared toward junior and senior high school students as well as managing the church’s programs for the homeless, the prison ministry and an HIV/AIDS program. During his tenure as a minister, numerous city and community outreach programs were conceived and implemented including the development of The Institute for Leadership, a non-profit organization dedicated to making future leaders of the city’s youth. He is a 1992-1993 Coro Leadership New York Fellow and has served as regional chaplain for the New York State Office of Family and Children Services, vice president for community government relations at King’s College and advisor to former New York City Mayor Rudy Giuliani as a member of the Task Force on Police Community Relations and Commissioner for the City Charter Revision. "The jobless rate is my community and others like it is staggering" said Faulkner. "My plan for creating jobs is based on something we call "Jobenomics" which is based on a book by economist Chuck Vollmer, with a goal of creating 20 million private sector jobs by the year 2020. The Jobenomics initiative is focused on teaching people to achieve personal freedom and dignity through finding and maintaining meaningful work. Jobenomics will provide mentoring from established coaches and successful individuals. We have also secured relationships with various lending institutions to assist qualified businesses to receive the microfinance loans to these small businesses which have been traditionally underserved by mainstream financial institutions", declared Faulkner. Faulkner takes issue with the Obama administration's policy of entitlements and government bailouts. "I don't believe in entitlements because I feel it diminishes the dignity and value of the American worker. The Talmud explains that the highest form of charity is to give in such a way as to affirm a person's dignity, worth and value. This means that it is much more valuable to give a person a job, meaning a hand up, rather than a check for not working such as a hand out. I will support entrepreneurial initiatives in my community which expand economic opportunities, foster a path to economic self-reliance, and restore the promise of the American Dream", he intoned. As to the thorny issue of health care reform, Rev. Faulkner weighs in on his opinion of the Obamacare plan. "This bill was signed into law before any legislators had read it completely, which means they committed the American public and taxpayers to undisclosed and undetermined costs for benefits that will not be fully realized within 10 years", says Faulkner. "The health care industry is extremely complex. The amount of federal controls and regulations that were added to this bill to ensure its enforcement are dangerous. I believe a great deal could have been accomplished with stronger tort reform and a deregulation of the interstate health insurance provision. Such deregulation would allow for competition between insurance companies, which would have eventually driven down the cost. We all now wait with baited breath for exactly what these costs will be to every American. This healthcare reform bill is detrimental to New Yorkers as it will cause the loss of thousands of jobs throughout the state and will be responsible for the closure of hundreds of community health care facilities including hospitals and nursing homes", he said. Rev. Faulkner tells INN that he is looking forward to speaking out and making a difference on issues pertaining to foreign affairs as well while in Congress. "Let's make it abundantly clear. The pressure that Israel faces under the current administration has got to stop", says Faulkner. "Look, I am a proud Zionist and not not ashamed to admit it. I am also a Christian evangelical and my total support is behind Israel because I am enjoined by scripture. I can tell you that millions of other Christian evangelicals feel the same way that I do. We have got to get the message out that the security of the United States is inextricably tied to Israel's security and we have to do everything in our power to ensure that Israel's security is not compromised", he declared. When asked about President Obama's plans to compel the Netanyahu government to extend the freeze on settlement construction in Judea, Samaria and parts of East Jerusalem, Faulkner says, 'I am tired of hearing the words 'occupation' and 'return to 1967 borders' when it comes to defining Israel because that simply is not the case. Israel is not an occupying power and thus anyone who says that Jewish settlement construction is an obstacle to peace in the Middle East is just using that as a smokescreen. The real obstacle to peace in that region are terrorists such as Hamas, Hezbollah and other Iranian proxies." As to Rev. Faulkner's perspectives on the creation of a Palestinian state, he says, "The Palestinians could have had an independent state in the past but they didn't come to the table. Israel has made territorial compromises and has proffered numerous peace proposals, only to be with resistance by those who really do not want peace. Any proposal for the creation of a Palestinian state must come from Israel and not the US and if such a state is established it must be demilitarized for security reasons." Expressing anger at the myopic view of the Obama administration as it pertains to the Israeli-Palestinian conflict, Faulkner says, "Obama has participated in the delegitimization of Israel through his maltreatment of our best friend and stalwart ally in the region. By doing so he helps to fuel feelings of anti-Semitism. Where does he come off meddling in the internal affairs of Israel? Doesn't our president understand that our best hope for peace lies in solidifying our relationship with Israel rather than alienating her? Doesn't he comprehend the fact that any attack on the Jewish people and their land will be the harbinger for attacks on Christians and other peoples of the Western world?" Concerning the Iranian nuclear arms threat, Rev Faulkner is quite clear. "You cannot appease these people because they are driven to destroy the West. I don't feel our president should be traveling to the Middle East and apologizing for America's support for Israel. Iran and Syria must be taken to task for underwriting and hosting terrorism in the region and the US should make it clear that we will not negotiate with terrorists under any conditions." Citing the significance of the upcoming November 2nd mid-term elections, Rev. Faulkner makes a heartfelt appeal: "This is a most important and critical election that will help define the trajectory that our country, and the world for that matter, is taking. The Jewish people have the opportunity to help Israel through their participation in the electoral process. I look forward to working with my Jewish supporters to make our country stronger and better for future generations." Rev. Faulkner's candidacy has received endorsements from FOX TV commentator Sean Hannity, the New Era Democrats, the Frederick Douglass Foundation, the East Harlem Concerned Pastors, Operation Black Storm, the Black Republicans PAC, the New York and National Right to Life parties, Newt Gingrich, the Republican Party of the State of New York, the Libertarian Party of the State of New York,Harold Augustus, West Harlem Senior Citizen Center, Howard Bernstein, West Harlem Senior Citizen Center, Apostle Edwards, One Way International Ministry, Yvonne Russell, Financial Network, Pastor Nelson, President, World International Chaplaincy, Pastor Debra L Smith, Christ Holiness Temple, Bishop Randall B. Gillis, Overseer, El Shaddei Church, Deacon Diaz, Calvary Baptist Church, Pastor Michael Bozwa, Zion Tabernacle and Chaplain Desiree Bernstein, United Chaplains of the State of New York.